Shark Week is here! It’s the perfect opportunity to do some fun, educational activities with your kids over the summer no matter what the age! 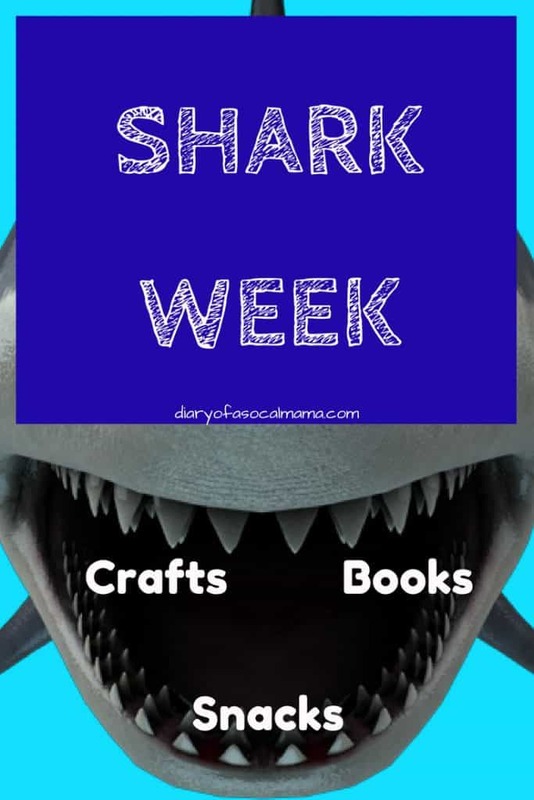 If you’re looking to celebrate Shark Week, or just have a kid that loves sharks, check out this list of great crafts, snacks, toys, and books for the shark-obsessed. These ideas are also great if you are planning a Shark themed birthday party! This post contains affiliate links. If you make a purchase after clicking these links I may earn a commission at no additional cost to you. 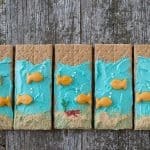 If you’re looking for fun snacks check out this cool oceanscape made from graham crackers and goldfish. These could be made by kids of all ages. My toddler loves graham crackers and goldfish and she could even make this with a little help from mom. Full instructions at The First Year Blog. When I was kid I definitely loved suckers. 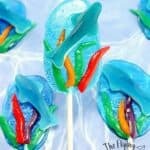 Kids can make their own shark themed suckers with this recipe from The Flying Couponer. They are a whole lot sweet and a little bit scary. Your kids will absolutely love them! Kids will love playing Sharky’s Diner after watching an episode of Shark Week. Even Dr. Seuss has gotten in on the Shark action with a title called “Hark a Shark“! 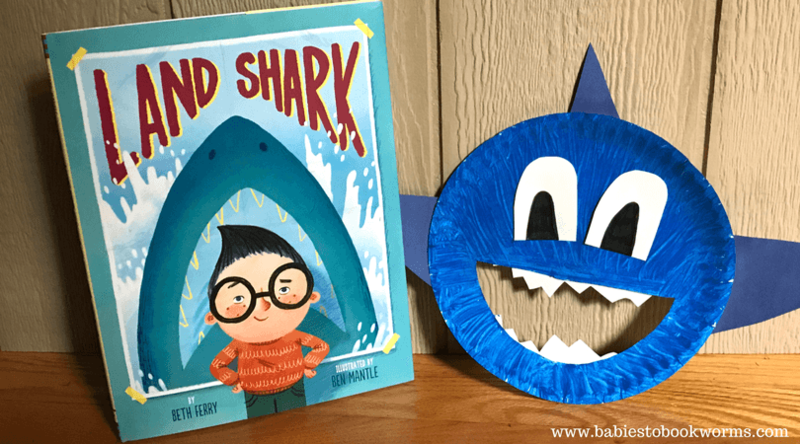 “Land Shark” is a fun book about a boy who wants a shark for his birthday! That must be a hard one for mom and dad to fill! What kid doesn’t love some craft time fun. Set up some crafts for a birthday party or set up some themed activities for Shark Week. 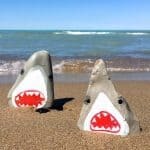 Your kids will already be in a shark state of mind so use these ideas to keep them from the dreaded summer boredom. Painted rocks are super popular right now. When they’re done they can hide them at the park, beach, or just keep them for themselves. These cuties from Sustain my craft habit just require some flat rocks, a little paint, and your kids creative talent. Word searches are so much fun. 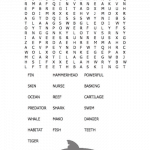 Go to Jinxy Kids to download this fun shark themed word search. No email sign-up required! After learning all about sharks your kids will certainly want to play sharks. 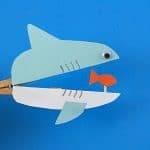 Check out these fun clothespin shark puppets you can help them make. 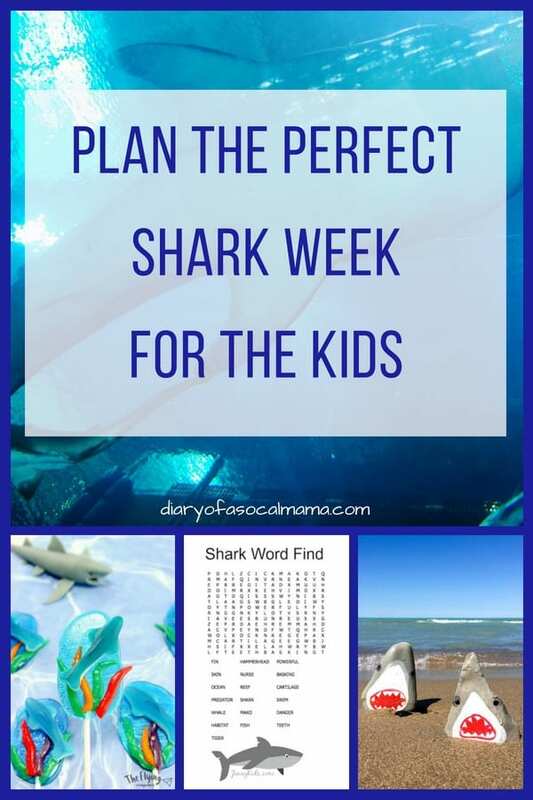 If you like to tie things together grab the “Land Shark” book mentioned above then visit my friend Babies to Bookworms for some crafts and activities to turn it into an entire learning activity! Wondering when is Shark Week? In 2018 Shark Week will kick off on Sunday, July 22nd. It will be the 30th installment of Shark Week! I’ll add a link to the full line-up when it becomes available. I hope you and your kids have an amazing time celebrating Shark Week! If you like this list please pin or share it so others can enjoy it too!